Nearly every business depends on its network to provide information services to carry out essential activities, and network intrusion attacks have been growing increasingly frequent and severe. When network intrusions do occur, it’s imperative that a thorough and systematic analysis and investigation of the attack is conducted to determine the nature of the threat and the extent of information lost, stolen, or damaged during the attack. A thorough and timely investigation and response can serve to minimize network downtime and ensure that critical business systems are maintained in full operation. 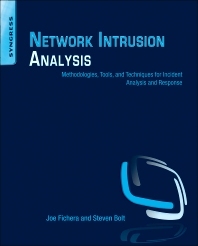 Network Intrusion Analysis teaches the reader about the various tools and techniques to use during a network intrusion investigation. The book focuses on the methodology of an attack as well as the investigative methodology, challenges, and concerns. This is the first book that provides such a thorough analysis of network intrusion investigation and response. Providing a step-by-step guide to the tools and techniques used in the analysis and investigation of a network intrusion. Providing real-world examples of network intrusions, along with associated workarounds. *Walking you through the methodology and practical steps needed to conduct a thorough intrusion investigation and incident response, including a wealth of practical, hands-on tools for incident assessment and mitigation. EnCase Portable, Guidance Software, Inc.
Joe Fichera is a Sr. Consultant for a global corporation. He is a former computer forensic leader, instructor and curriculum developer for to the Defense Cyber Investigations Training Academy. He holds the following certifications; CISSP, EnCE, EnCEP, CCE, ACE, CTT+, SCNS, A+, Network+, and MCP certifications.